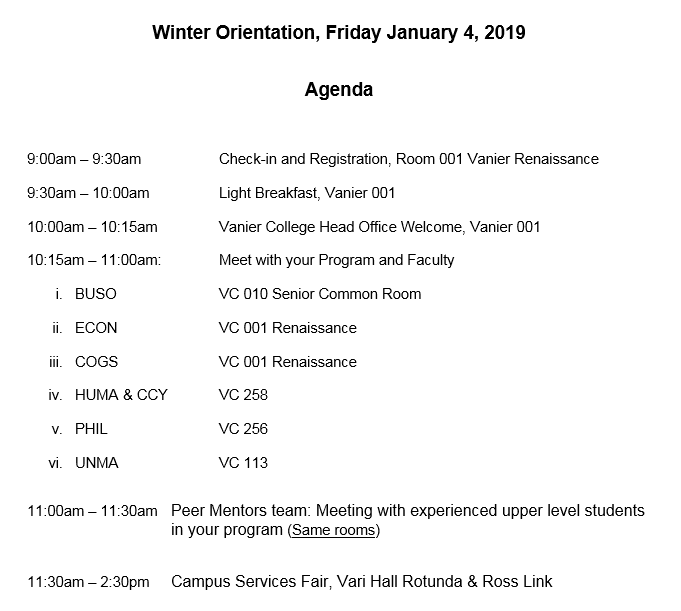 The Office of the Head, Vanier College invites you to Vanier's Winter Orientation on Friday, January 4th, 2019 from 9:00 a.m. – 11:30 a.m. in room 001 Vanier College. This Orientation is specific to your program of study and is mandatory for all incoming students. Whether you are coming from high school, transferring from a community college or entering as an international student, Academic Orientation will help you make a successful transition to university life. During the Campus Services Fair, students will have a chance to connect directly to key campus partners who can support their first-year transition. These services including student finances, learning resources, writing support, libraries, community safety, transportation and parking, athletics, health and wellness resource to name a few. During the fair, you can also join a First Year Tour – Where you will be joining the RED Zone Ambassadors in an indoor tour around Keele campus. Tours leave every hour from 12 pm, 1 pm and 2 pm from the Vari Hall Kiosk. The tour is designed to help you familiarize yourself with key areas (where to eat, where to workout, getting your YU-Card) and also teaches you how to find your classrooms, reading the map and understanding your course timetable! We look forward to seeing you on Friday, January 4th, 2019 for Vanier's Academic Orientation. Colleges at York University are vital hubs of connection for students and faculty. Each academic program of study is affiliated with a College; your program is affiliated with Vanier College. Vanier College provides a warm, friendly setting for students to meet other students, faculty, and staff members. Not only do we host the Fall Orientation for your program, we also collaborate with your respective program to offer workshops suited to your program of study. These workshops are designed to help you in every aspect of university life, such as essay writing, library skills, time management, and choosing a major. Register for York Orientation Day via YU Start Login Page, and for more information, visit York Orientation Day. Where: Near the end of August, you will receive a ticket in the mail, as well as an email, indicating your "program-specific" venue. For check-in, bring your YU-Card and ticket.